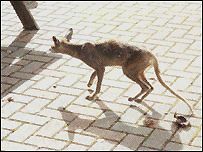 Pollok, Texas “Chupa”- Strange Mammal or Mangy Coyote? 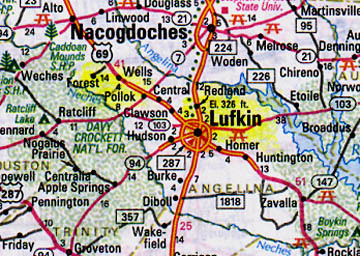 Pollok, Texas, is northwest of Lufkin, which is north of Galveston, Texas on the Gulf. October 20, 2004 Pollok, Texas – I have been receiving dozens of e-mails from people around the world concerning the Pollok animal that some refer to as a “Chupa,” after the chupacabra mystery in Puerto Rico in the mid-1990s. 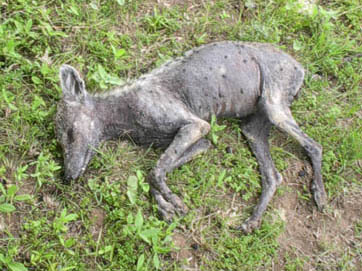 The most common explanation has been a coyote with mange. 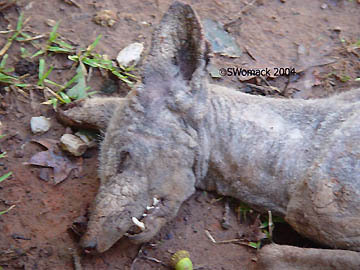 Manuel and Tammi Rego sent the photograph below of a mangy coyote shot in the ribs. When you compare the known mangy coyote with the animal shot in Pollok, Texas, there are similarities. 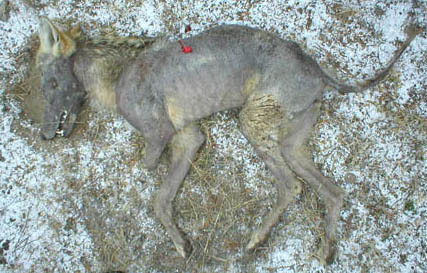 The strange Elmendorf animal with the spots on its body shot in May 2004, is also shown below. This week, BBC news in England reported that a “mystery creature” was photographed in Lisvane, a suburb of northern Cardiff. The Welsh Mountain Zoo’s Zoological Director said it might be a “young kangaroo.” The body was described as grey with a pointed nose, resembling somewhat the body shapes of the Elmendorf and Pollok creatures. Several others insist the Pollok and Elmendorf animals must be Xoloitzquintle, Mexican hairless dogs. See 07-31-04 Earthfiles. Many people have also e-mailed about the Tasmanian Tiger, Thylacine, which is supposed to be extinct and has stripes. You can compare the dogs and tiger from the photographs below. 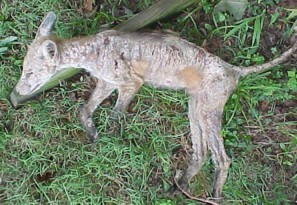 Coyote with mange, shot in the rib cage. Image by Manuel and Tammi Rego. Red fox with sarcoptic mange. Sarcoptic mange, commonly know as scabies, is caused by microscopic mites called Notoedres that burrows deep into the skin. It is contagious to other pets and occurs in many different animals. It causes intense itchiness, especially affecting the ear margins, elbows, and face. People can pick up this disease from their pet and show symptoms of itching, but it goes away by itself in a short time and does not require treatment in most cases. 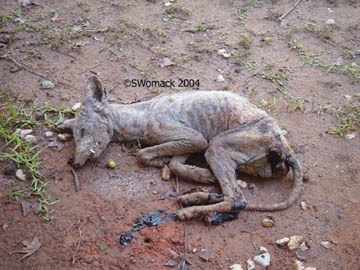 October 8, 2004, photograph of the unidentified animal soon after it was shot in the right eye by Stacey Womack’s brother in Pollok, Texas. Digital image © 2004 by Stacey Womack. Left side of Pollok animal’s head that has very large ears and extreme overbite, highlighted by tusk-like teeth. Image © 2004 by Stacey Womack. Unidentified animal photographed by Devin McAnally about six hours after he shot the creature, no blood. Described as about 20 inches tall, 30 inches long with 3-inch-long, thin, fangs that extended downward from upper jaw and overlapped with 1.5 inch fangs protruding upward from lower jaw. (Not visible in photos.) There are spots on the hide and sparse hair as described by eyewitnesses in Puerto Rico of the alleged “chupacabra goat-sucker” there. Digital photograph © 2004 by Devin McAnally. October 14, 2004, mystery creature photographed in Lisvane, suburb of northern Cardiff, British Isles. The Welsh Mountain Zoo’s Zoological Director said it might be a “young kangaroo.” The body was described as grey-brown with a pointed nose. 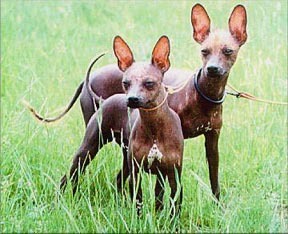 Xoloitzquintle, Mexican Hairless Dog, from Mexico. Aztecs considered these dogs representative of the god “Xolotl,” whose task was to accompany the souls of the dead to their eternal resting place. Aztecs prized the hairless dogs’ flesh and ate them. Postcard of Tasmanian Marsupial Wolf. Hobart Zoo © 1928 by G.P. Whitley Papers, Australian Museum Archives. The Thylacine (Thylacinus cynocephalus, dog-headed pouched-dog) is a large carnivorous marsupial now believed to be extinct. It is the single member of the family Thylacinidae. It is also known as the Tasmanian Tiger or Tasmanian Wolf. “I thought I would write to let you know I have seen the strange creature in Oakville, Ontario, Canada as well. The pictures and descriptions match exactly the description I gave my friends and family trying to make them understand this strange animal I had seen. It is difficult in your heart you know what you have seen, but your brain has trouble because you can’t categorize it because it is unlike anything you have ever heard of or seen before. Everyone chalked it up to a genetically messed up, mangy coyote. Yet, another lady and myself who had both seen it on different occasions knew it was different. “I am a perfectly healthy, sane 31-year-old divorced mother of one, who works for my father’s company. I have seen this creature on two different occasions and there is no mistaking it. I also have a lot of experience working with animals and am familiar with wolves/coyote/foxes/deer. What I saw was none of those. It was exactly what you see in the pictures you show. I don’t know if I should be glad or concerned that there are more of them out there. It was truly bizarre. Not to mention everyone thought I was nuts (except for the other lady that saw it) because in their minds how could something like that I was describing exist, especially around here without people knowing about it? At least I feel better knowing that other people have seen it, too, and that they know what it’s like to know what you have seen but have no one able or willing to believe you. If I hadn’t seen it with my own eyes, I’d probably be skeptical, too. “I forwarded the link to the photo of the “Lufkin Animal” to my Showdogs-L email list. We are a large group of dog fanciers from all over the world. Some folks thought this might be a Xolocuintli, or large Mexican hairless dog. It was obviously not well cared for, and as David says they are found in the wild on occasion, and can automatically be registered with the Mexican Kennel Club if captured. WOW!!!!! They should contact the Mexican KC.